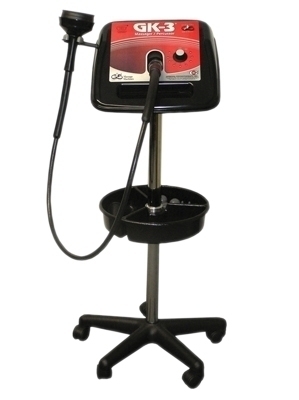 G5 massage machines have been sold and used successfully for over 50 years. They provide very deep penetrating massage using frequencies from 15 to 55 CPS. G5 massage machines are the only massagers with Directional Stroking, not vibration. They are reliable, durable and quiet. Using G5 massage machines over a hot pack or cold pack seems to drive in the heat or cold. They can be equally-effective when used over toweling or clothing, and won't tangle in hair. Speed ranges 15 to 60 CPS. Stroking percussion apparatus designed as an adjunct for massage. Complete with caster stand and tray. Can be used with pole, table-top or wall-mounted (mounting hardware extra). Includes PRO-PKG applicators. Dimensions: 21" x 45" x 21"